I am an ultra-conservative Jew that believes that Jesus Christ is Lord. I love God and try to respect people everywhere—even the Rothschild’s! A Marrano is a Jew who poses as Christian, but is not. The Rockefellers, Rothschild’s cousins, are part of the Marrano class. Their father is the Devil. They worship him in their special Synagogue. The Rothschild’s established Israel through blackmail and extortion in 1917. In return for Israel as a territory, Rothschild promised that the Yanks would help England to keep the Germans from winning the war. President Wilson brought the American Expeditionary Force into Europe to save England from starvation by the Germans. The evil side of the Roman Church has cooperated with the Rothschild Devils since Herod and Pilate arranged the crucifixion of God’s Son, Jesus Christ. God’s Roman banker, Ettore Gotti Tedeschi, is the present director of the Vatican Bank. The Vatican Bank does illegal money deals of vast proportions with Banco Ambrosiano and other banks as evidenced by their 1982 and 2009 billion-dollar money-laundering schemes. Here’s more evidence I have determined: Ettore Gottis Tedwschi, Vatican Bank, is also the Chairman of the Board of Banco Ambrosiano! Vladimir Ilyich Lenin, the key Bolshaevik talking head, commented once that the New World Order “Will be like a boot kicking you in the face every day”. The Facebook psychopaths will see to that– as you know from my earlier Facebook presentations at thebigbadbank.com. 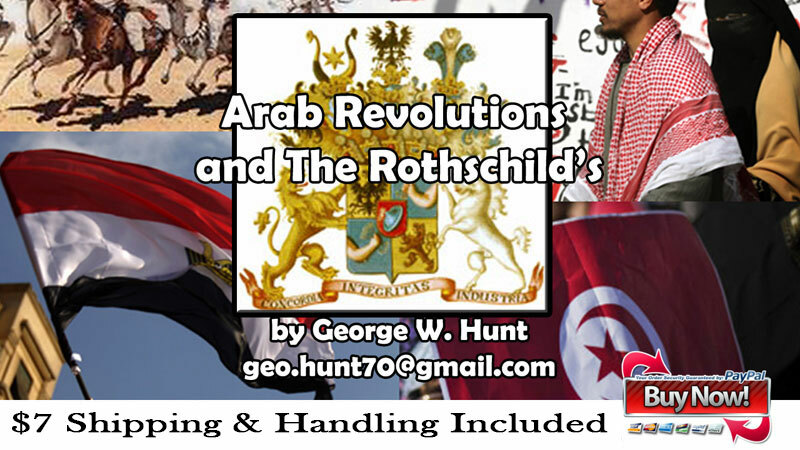 I will soon go to Algeria, Libya, Tunisia and other African countries to see if I can learn how Rothschild cooks up revolutions. My guess right now is that Rothschild wants to restore the old Ottoman Empire to himself. I want to learn first-hand if I can, how a Rothschild revolution works. I believe Mubarak is a puppet of the New World Order and the Rothschild team is actually in control of the supposed revolutions that are occurring in North Africa. Just as the Bolsheviks, the Reds as in Rothschild, uprooted the Czar and put Stalin into power, the African nations may suffer a similar fate. While I am gone, each of you who have viewed this presentation and have found this and my videotapes at “thebigbadbank.com” valuable for your social networking groups to know, please share this knowledge since 1987 with your friends. In 1987 I was threatened by David Rockefeller that if I didn’t keep my mouth shut (about the secret Rothschild/Rockefeller meeting I had just pierced) I would regret it.” My videotaped recordings of their meeting rocketed through the underground. A year later I was threatened with a law suit by the producers of the 4th World Wilderness Congress for a half-million dollars for libel and slander against I. M. Sweatmen, the World Conservation Bank President. My site contains the actual videotape I produced in 1988 which ticked them off. My retort was “OK, I’d be glad to be sued. Then I can tell a judge and six jury members exactly what you are up to”. I was surprised at my courage, and I have never heard a peep from them again. The leaders are fearful paranoid lice. Judging by their acts and arrogance, they have to be connected to Satan-Lucifer the fallen angel.